The aboriginal boomerang has probably been around for at least 40,000 years. It is an iconic symbol associated with Australia. What most people do not realize is that many antique aboriginal boomerang don’t come back. Only a few of the many forms of old boomerang return. The aim of this article is to look at the variety of old Aboriginal boomerangs from around Australia. The boomerang is a weapon but it is also a collectible aboriginal art form. I buy traditional old Aboriginal Boomerangs. 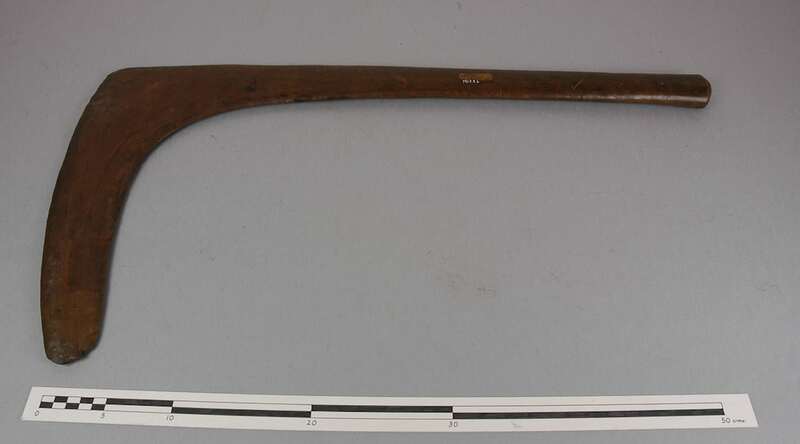 If you want to sell an antique Aboriginal Boomerang please send me an image. 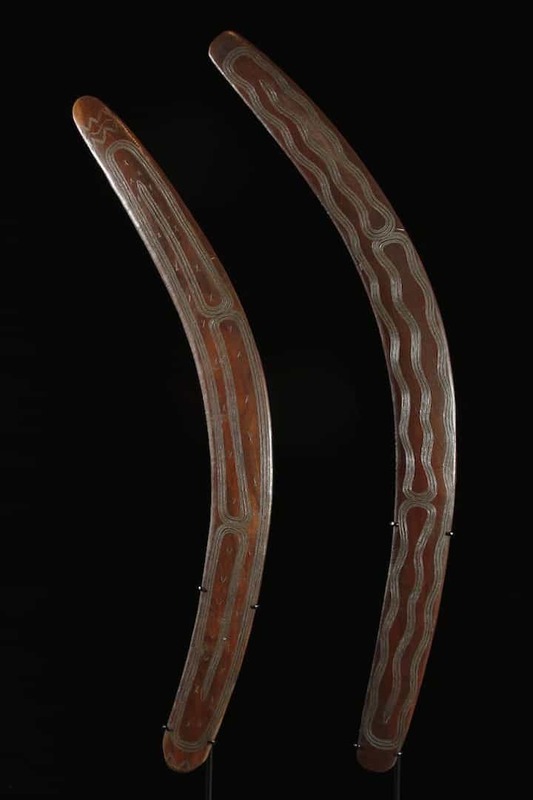 Antique aboriginal boomerangs come in a large variety of sizes, forms, and decoration. Different boomerangs had different functions. This variation reflects the social and cultural diversity of Aboriginal people. Aboriginals were not one group but had over 200 language groups. As mentioned most old boomerangs were not made to return. The function of most boomerangs is to hit and kill whatever they are thrown at. Some boomerangs were for hunting but others were for fighting. Some huge antique boomerangs were up to 2 meters long and function like clubs. The majority of aboriginal returning boomerangs were for hunting birds or as toys. The Aboriginal boomerang has great aerodynamic properties. It is capable of going 200 meters compared to a throwing stick, which will only travel 60 meters. Aboriginal Boomerangs could have engravings or be painted with ochre for ceremonial purposes. These designs are not decorative. Designs relate to the Dreamtime ancestors and totems. Collectors like boomerangs with designs far more than simple chip carved examples. The Aboriginal boomerang is also used as a digging tool, for making fire and as a club. Collectors like boomerangs that are old, unique, and rare or have elaborate designs. 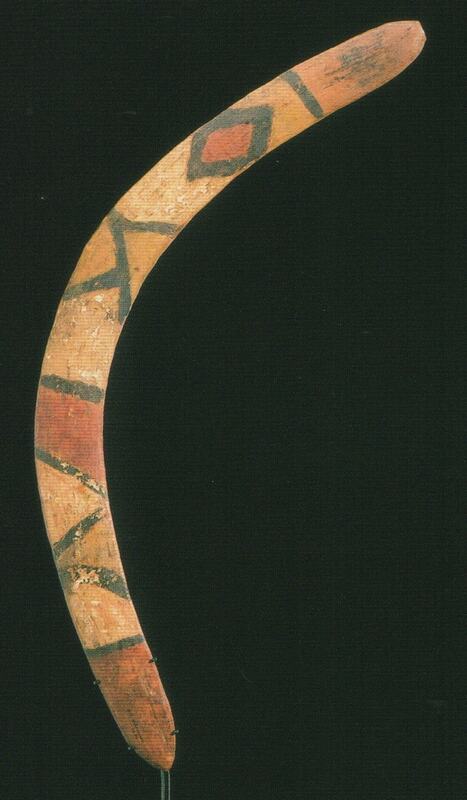 Boomerangs were also used in other non-aboriginal prehistoric societies. Rock paintings of boomerangs in North Africa date to 9,000 years ago. In Poland, archaeologists found a 23,000-year-old boomerang made of mammoth tusk. In fact, ancient boomerangs were in Germany, Vanuatu, Indonesia, India and the Hopi Indians in Arizona. What makes the Aboriginal boomerang unique is that it has continued to be useful until recent times. Aboriginal boomerangs have the greatest diversity of forms. Other cultures abandoned the boomerang after the invention of the bow and arrow. Antique aboriginal Boomerang from the Kimberley often have longitudinal fluting that follows the contours of the boomerang. Those from the Coastal region have one arm longer than the other. Inland Kimberley boomerangs tend to be symmetrical. They often have red ochre and white pipe clay stripes. The most collectible form has a tight zigzag or La Grange style of fluting on the reverse. Kimberley Boomerangs and Bardi shields are used in inter-clan warfare. Fishing Boomerangs are asymmetric longitudinally and symmetrical in cross section. It is often undecorated and not ochred. They are often used in shallow tidal water to kill larger fish and other marine animals. Made from heavy woods or some late examples made of steel. It takes a strong throw to kill a fish even near the surface. They could be retrieved after the tide had gone out. These boomerangs are popular with collectors because they are lovingly incised. There are two main types. Long fighting boomerangs are like a club. They are thick because they don’t need to be aerodynamic and up to six feet long. These are to all intents and purposes an Aboriginal club. They are boomerang shaped though and known as fighting boomerangs. 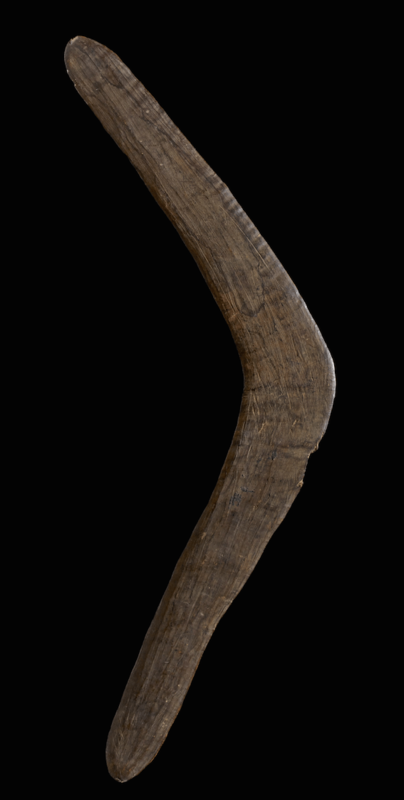 Smaller throwing boomerangs were also used in combat and tend to be flat on the bottom and concave on the top. Collectors value them for the designs. Pinched ends are also desirable. These boomerangs are quite common and do not vary much from the example shown. They often have longitudinal grooves and are convex on the top and flattish on the bottom. They are normally covered in red ochre. It is possible that the longitudinal grooves improve its aerodynamics in a similar way as dimples on a golf ball. The central Australian Fighting boomerang is sometimes called a number 7 boomerang or a swan neck boomerang. The most collectible variety has a small notch at the top of the neck. The design of this boomerang is for fighting. The protrusion will catch on the opponents shield and the long shaft whip around and inflict the damage. These boomerangs were so sort after that they also acted as a form of currency. They used to be traded between tribes over vast areas. Antique aboriginal Boomerang from Western Australia are undecorated, with a thin blade and rounded ends. They are not highly sorted after by collectors but there are exceptions. The main exception is boomerangs from this region with one straight arm and the other with a concave twist. Old Aboriginal boomerang from North Queensland are brightly painted with designs like the shields from this region. The area around Cairns also has one of the rarest form of boomerangs called a cross boomerang. Cross boomerangs were a child’s toy. Boomerangs from this area are generally a crescent shape. They tend to be quite large averaging 90 cm long. They lack decoration or have only a few shallow incisions. Other than those from Mornington Island they are unpainted. Two main types of Boomerang come from this region. First of all small often steeply curved returning boomerangs used for hunting birds. These small boomerangs are plain and not ochred. The second type is fighting boomerangs. These were up to 90 cm and used to kill game or enemies. These are symmetrical longitudinally but convex on top and flatter on the bottom. This area also has a form of a rare club called a Lil Lil club. Lil Lil clubs are boomerang shaped and aerodynamic. All antique aboriginal boomerang are collectible but some are much more collectible than others. The most collectible antique boomerangs are the rarest, oldest authentic examples. Designs on the boomerang are often unique and are important. When used in ceremony boomerangs were often used in pairs. To have a pair of matched boomerangs is more desirable than a single item. Boomerangs that are at the extremes of their type are also sort after. Collectors want the longest fighting boomerang or a returning boomerang with an extremely tight angle. Anything that is bizarre or unusual so long as it is old and authentic is a collectors delight. Is it an Antique Boomerang? While a lightweight returning boomerang for hunting birds is seen next to a long sword Club from Queensland this is an easy question. As the diagram shows the transition from throwing club to flattened throwing club to boomerang is gradual. The transition from wooden hatchet to Lil Lil club to boomerang is equally gradual. In general, if it is flat and made to throw it is a Boomerang.